Hudson Valley Flying Circus | YOUNG STARS ARRIVE @ CIRCUS !!!!!!! YOUNG STARS ARRIVE @ CIRCUS !!!!!!! March 19 —— The call went out…..by word of mouth and digital electric air- waves…. and a talented and motivated young group of curious young athletes arrived at the Vault Barn on Saturday morning for the 2nd ‘LEARN HOW TO POLE VAULT DAY’…. presented by Flying Circus. The 26 young stars ..ranging from grades 4-10…could not be held back…as they took up the flight of faith all day long. 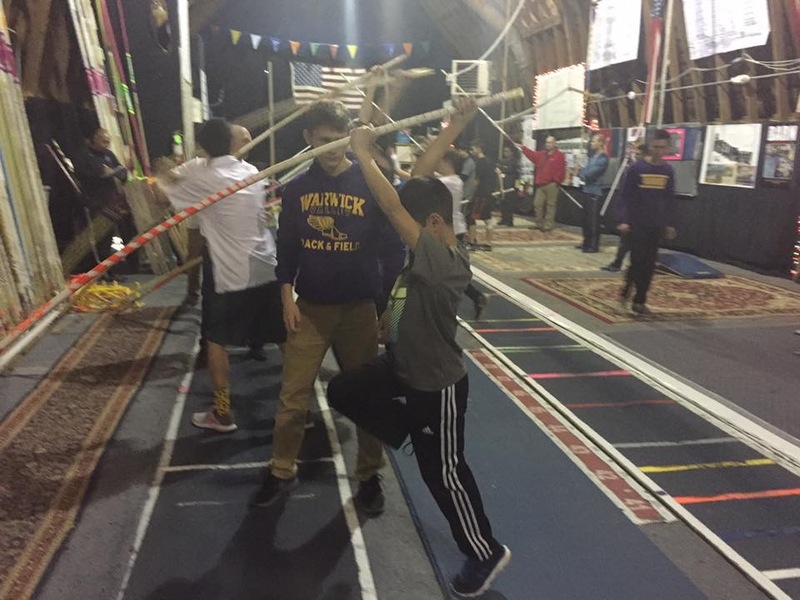 Staff coaches…volunteer HS pole vaulters were on hand to move our event up a few more levels. The future of pole vault has begun and we all would like to thank all parents and coaches for sending us some very inspired student/athletes. Yes… It was a glance at the future!!!!! More to come ………..
* The FLYING CIRCUS would like to THANK EVERYONE for “Lending-A-Hand” in many different ways in helping The Tony & Patricia Majweski Family in recovering from their devastating loss of their house 3 weeks ago here in Warwick,NY due to fire. The Majewski Family… a life long and inspiring supporter of Warwick Valley Schools…Community Projects and Athletics are very touched by your donations and help …. our club and community members raised over $6,700 to help them get back on their feet. Thank you for reaching deep for them. * EASTER WEEKEND SCHEDULE…. The Flying Circus will be CLOSED ALL DAY on Sunday March 27..so that we can all spent the day with family….but we are opening on Saturday March 26…. 12:30-2PM for Girls Open Session…. and 2-3:30PM for the Boys Open Session. We hope you can join us…as we move outside to our 4 pits for instruction and acclamation to the open spaces of spring vaulting. * Our Tuesday and Thursday evening ‘s Open sessions will end Tuesday March 29…as our area meets will be starting up soon after that. Private sessions will continue on Wednesday and Thursdays’ by appointment with Staff Coaches only. * SUMMER CAMPS filling up F-A-S-T !!!! if you are serious about being with us the summer… enter ASAP!!! We are proud to announce our 2016 INDOOR COACH of the YEAR AWARD to one special person… BEN SIMONET . It’s hard to explain the impact that Coach Ben Simonet has had on so many young athletes here at Warwick Flying Circus and especially at The Armory Flying Circus in busy New York City. Ben has modeled the perfect coach/athlete positive influence and his developing of the Pole Vault Event in New York City has been inspiring to everyone he works with. His knowledge and his patience are his strongest traits and and his humility is contagious. He was the 3-Time Belgium Pole Vault Champion..with a PR of 17′ 5.5″ after taking up this event late in his career. He became a gymnastic and physical education teacher and continues to inspire all of us here. CONGRATULATIONS COACH SIMONET !!!!!!!!!!!!! FLYING CIRCUS ……………CROSS-the-BRIDGE with us.